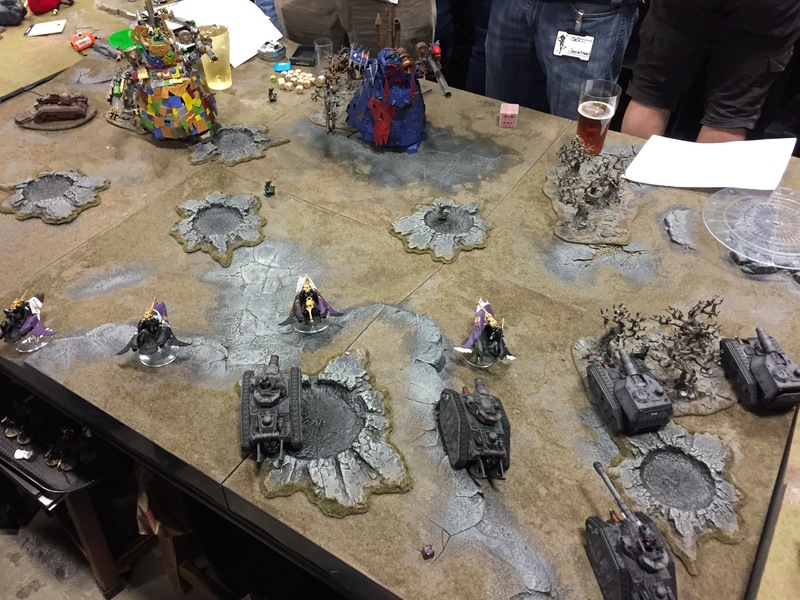 At the same time as Armies on Parade took place I was also attending The Great Devourer Battle Brothers event at Warhammer World, 15th and 16th October 2016. 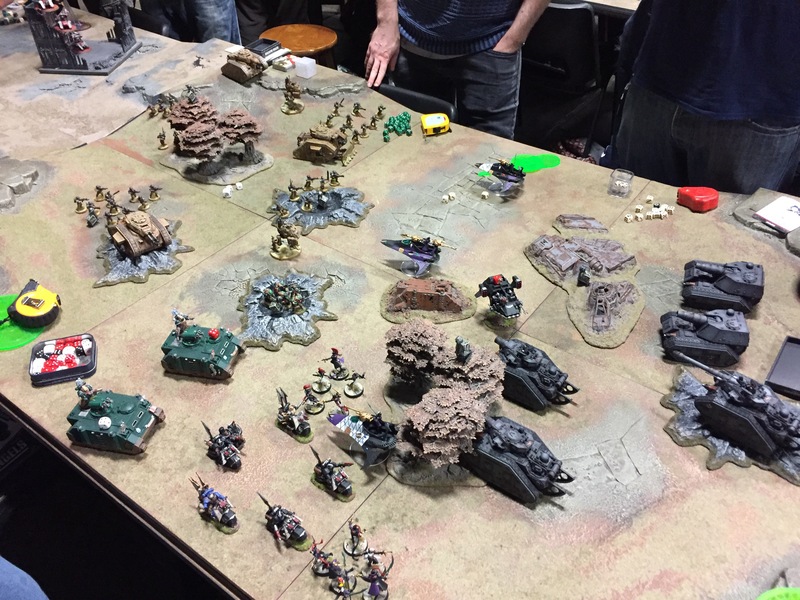 Paired up with my partner Joe Coles, we each took a 800pt army and played together in 5 Maelstrom of War missions. 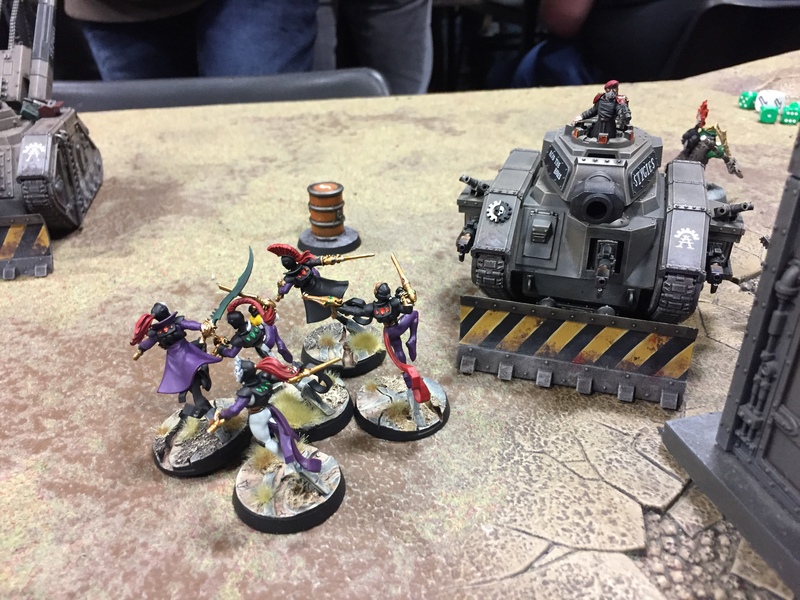 I’ve played several Battle Brothers events before but this was a first for teaming up with Joe, meaning my Krieg army was joined by his Harlequins which made for an interesting matchup. In addition to the usual Maelstrom Mission rules a custom rule was also in effect called Target priority. The rule for which is listed below. 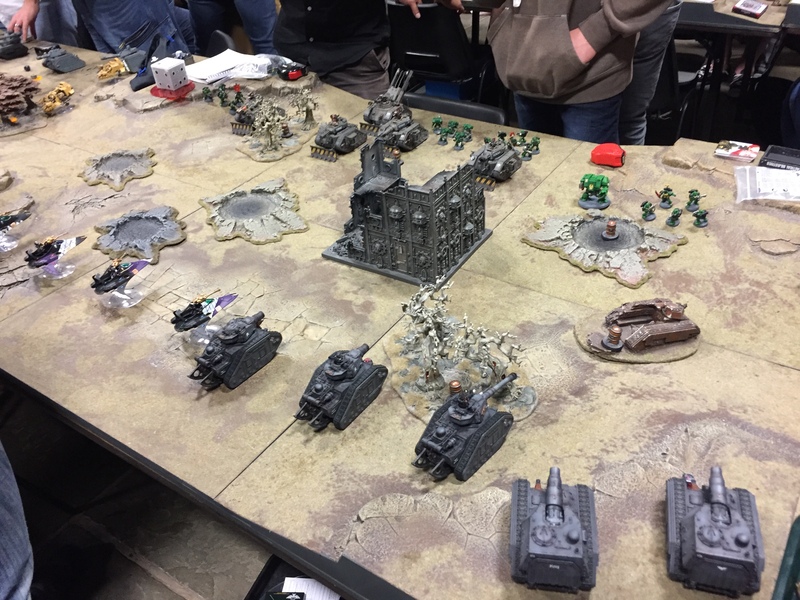 As it was the same weekend as Armies of Parade the majority of my Krieg troops were on display as part of my Armies on Parade trench board, this led me to run a tank heavy list which became the Armoured Battlegroup, from Imperial Armour v1 2nd edition. My main list was an HQ Vanquisher tank, two demolishers and two medusas. This gave me a solid block with lots of anti-tank which complimented Joe’s lighting fast but fragile Harlequins. 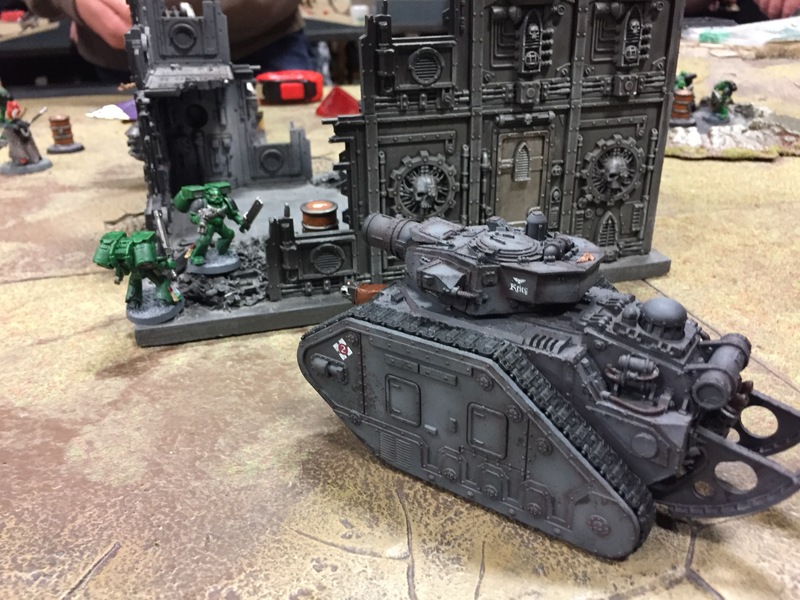 My alternative list was the HQ Vanquisher tank, upgraded with Beast hunter shells, Co-axial stubber and Artificer Hull (+1HP), lascannon and alongside it was a Baneblade. I really only took this list so I could legitimately enter the Baneblade into the painting competition as you can only enter models which took part over the weekend. 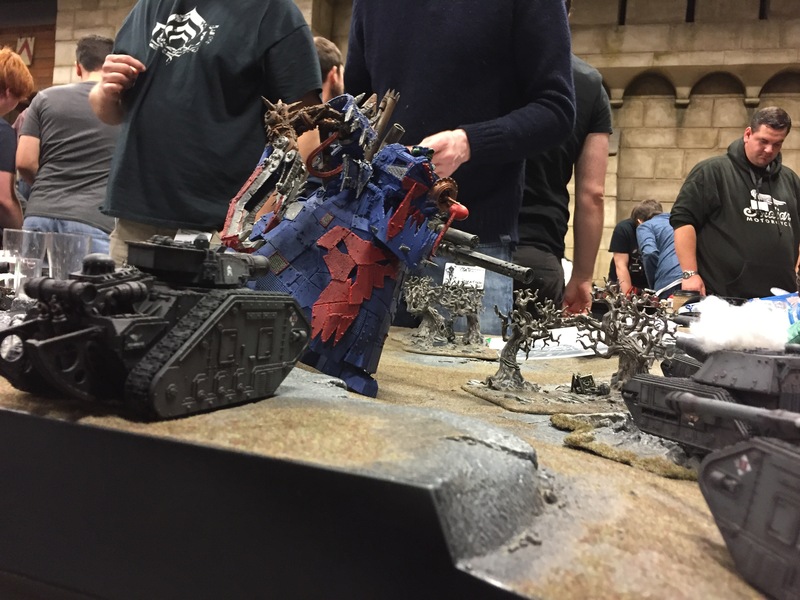 The same model took home the Engines of Legend competition at the Reign of Blood Campaign weekend while in the Stormsword loadout. Access to Beast hunter shells: Small blast, instant death. Perfect for taking out Monstrous creatures. Objective Secured tanks: As this is a CAD, the Demolishers are Troop choices making them ObSec. Tank orders: Works differently than standard orders, the best one by far is Concentrated Fire, forcing your opponent to re-roll cover saves. 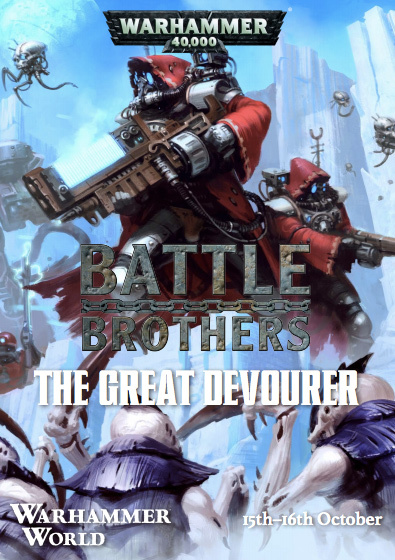 Full details of the Battle Brothers: The Great Devourer event can be found over on the Warhammer World website. It’s rare to see one Super Heavy in a Battle Brothers event, let alone two, so this was a fun match. Joe’s Harlequin’s managed to lock one up in combat for most of the game while I chipped away at the other while it pressed ever closer towards me. 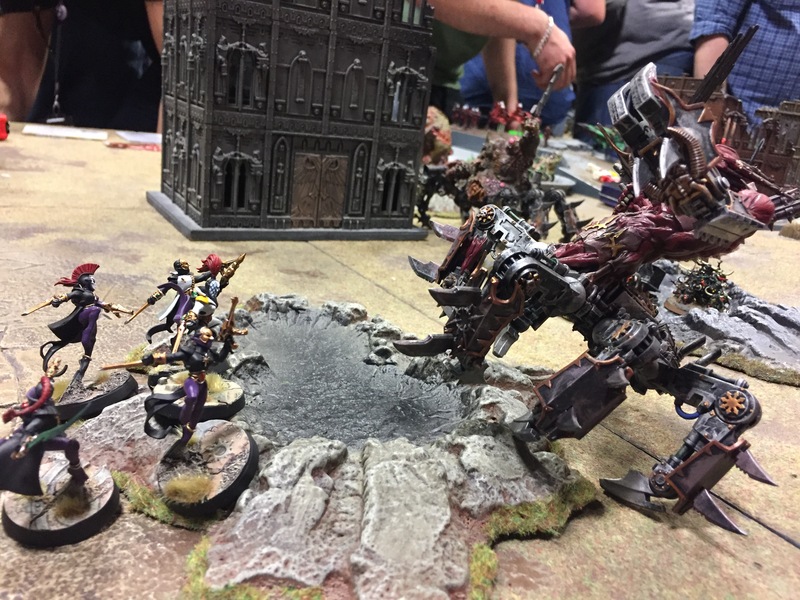 The Stompa locked in combat fell after several gruelling rounds of close combat, the Harlequin Troupe decimated from the Stomp attacks leaving only a sole survivor. My tanks were slowly falling one at a time having lost both Medusa’s and one Demolisher. The remaining Stompa with little health remaining was reduced to 1HP thanks to a valiant suicidal charge by the sole Harlequin. On the final round of shooting everything hinged on the Demolisher. 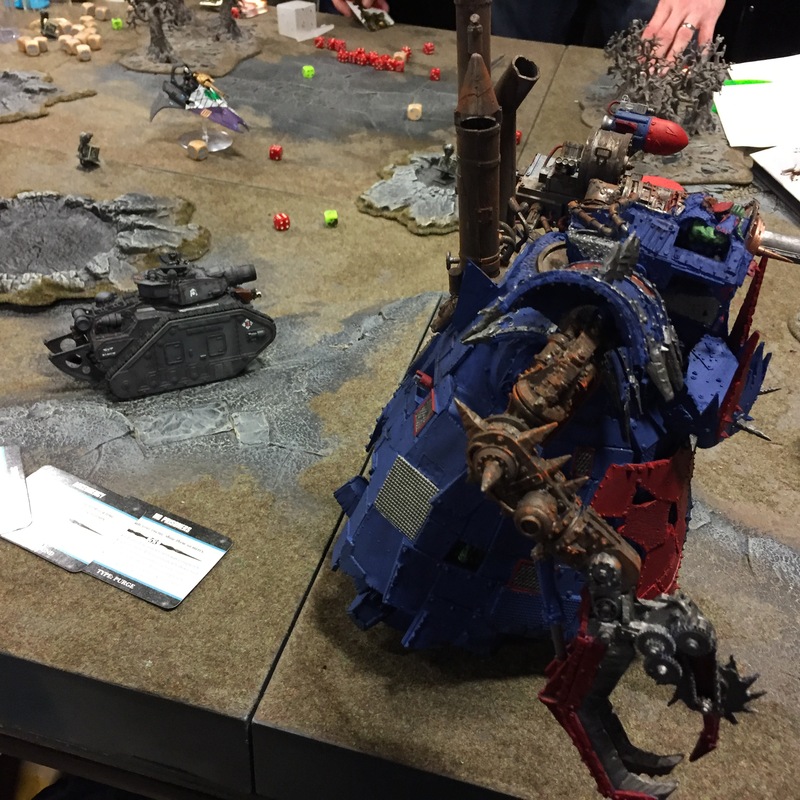 It managed to successfully shoot the Stompa in the back winning us the game. 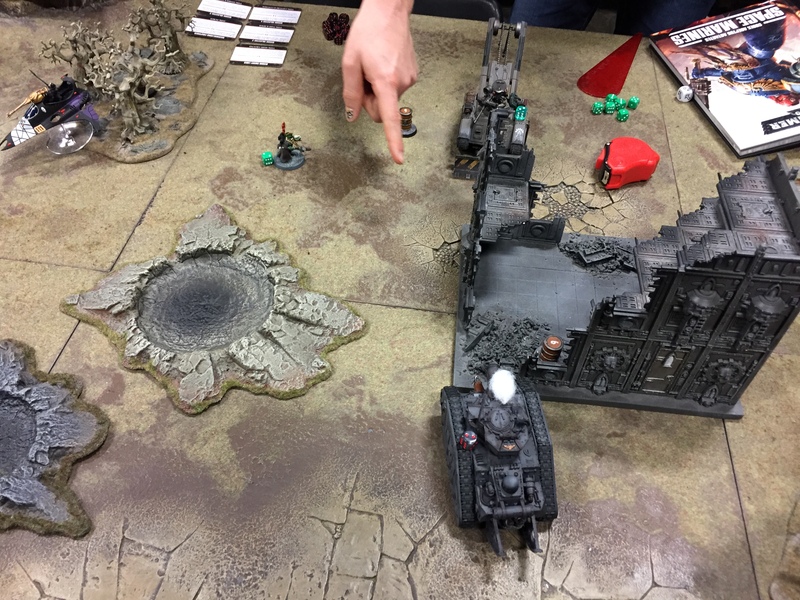 This was a pretty tough matchup against a White Scar bike list. 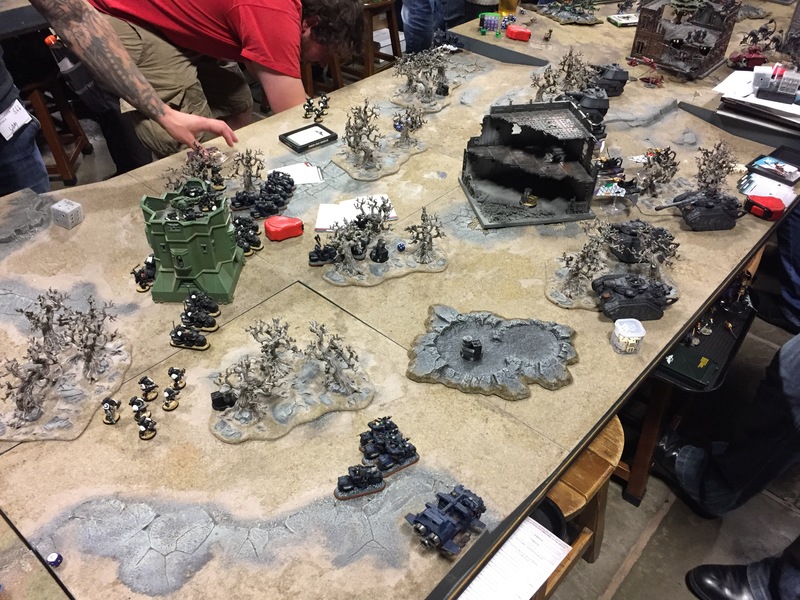 The centre of the table quickly becoming the main battleground against the White Scar’s warlord units vs the Harlequins. The Troupe did a lot of damage but were eventually wiped out. 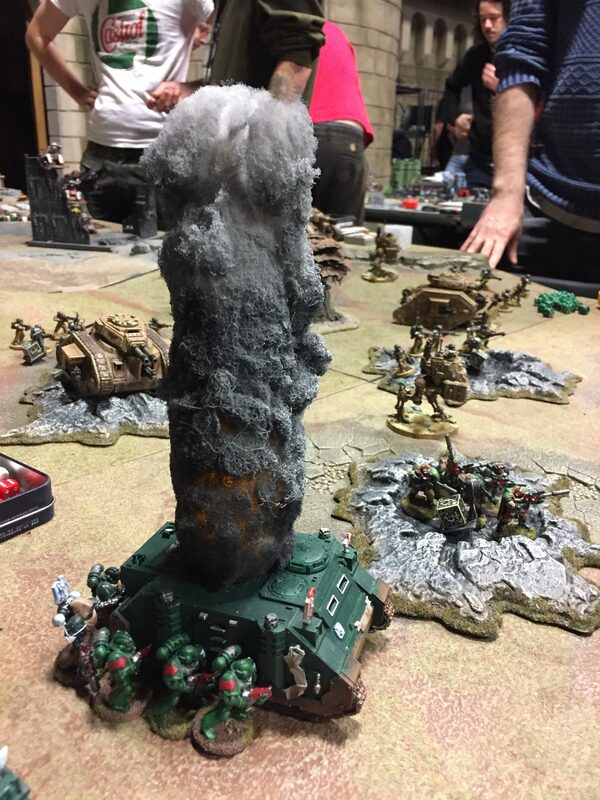 There were a few rule interpretations which didn’t go in our favour, meaning that the tanks didn’t get cover saves while in woods or craters and the Scouts absolutely wrecked the Leman Russ’s in close combat as each model was able to use grenades rather than one grenade per squad. The main drawback we discovered though was that if the tanks were hit, they would be often be forced to Snapshot, meaning the main ordinance gun was out of action for a turn. This crippled my army completely and in the entire game my whole army only killed one model. This was my favourite game of weekend. I had instantly recognised the amazing Astra Militarum tank army (with a custom converted Atlas tank), having seen it in White Dwarf. It turns out to be owned by White Dwarf writer Dan Harden. 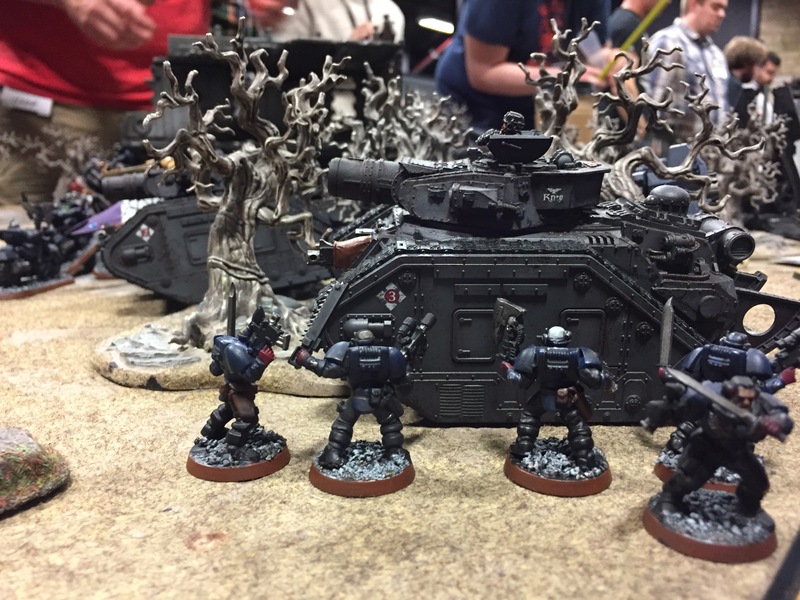 His partner rocked a Space Marine Salamander army. 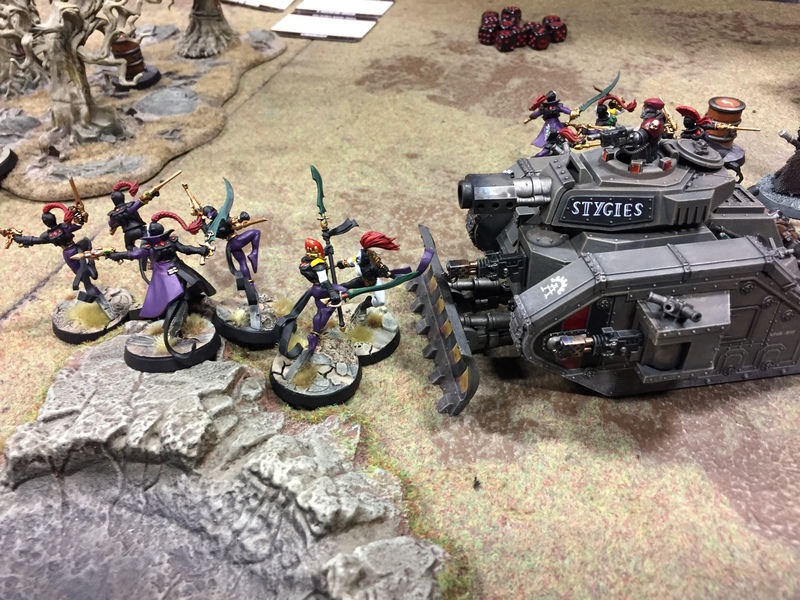 Turn one saw Dan’s tanks roll forward, unaware of the danger the Harlequins posed, who in their turn dashed forward making short work of a few tanks. Meanwhile my tanks focused on the Salamanders and had immobilised the Dreadnought. In turn two, the Atlas made a beeline for the Dreadnought planning on dragging it around the board. 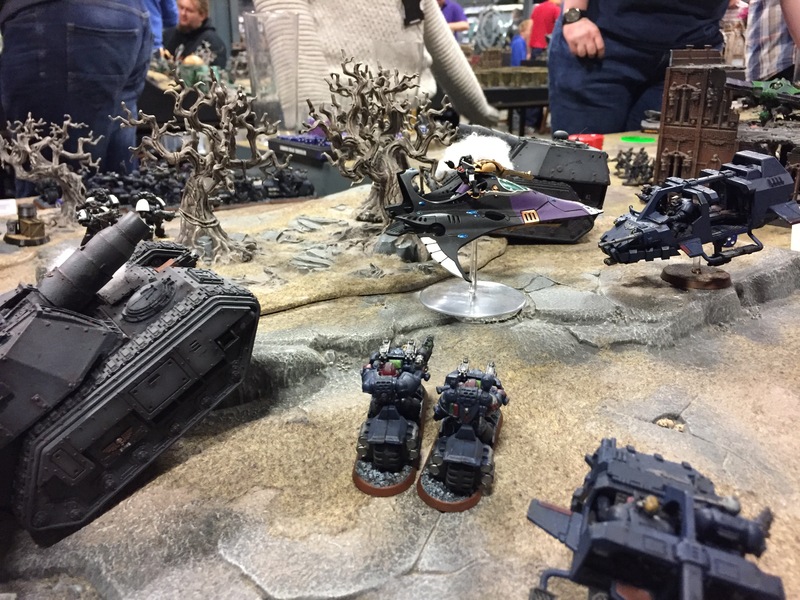 Meanwhile the Eradicator tank kitted out with flamers charged ahead into short range on the Harlequins, it’s flamers annihilating the best part of two full units. The Salamanders moved up to the middle objective but still couldn’t claim it due to my Objective Secured Demolisher. To retaliate the Demolisher fired danger close wiping out the Marines on the objective. 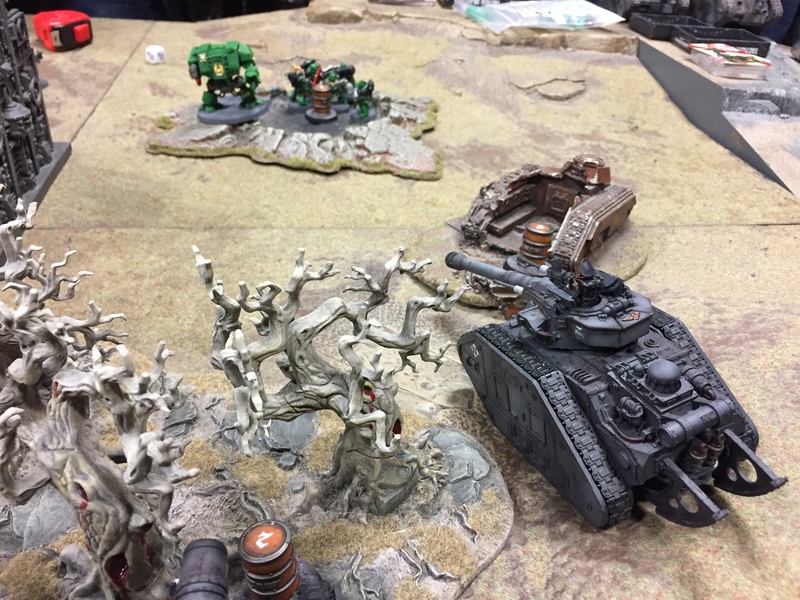 By the end of the match all that remained were a few Krieg tanks, the Salamanders Warlord and a flyer. 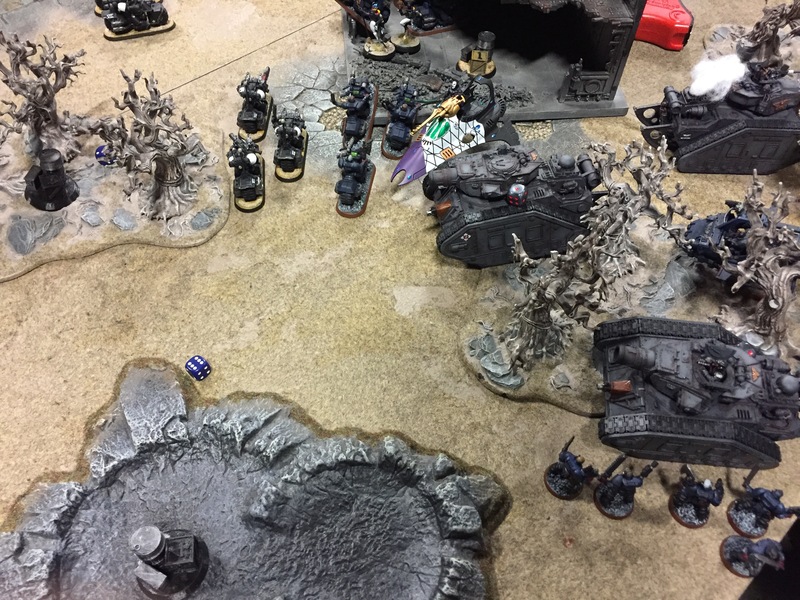 The last turn came down to a few desperate rolls to try and kill their warlord, but failing to only knock it down to one wound. Due to the weekends special rules, killing him would have gained us the extra VPs we needed to win. 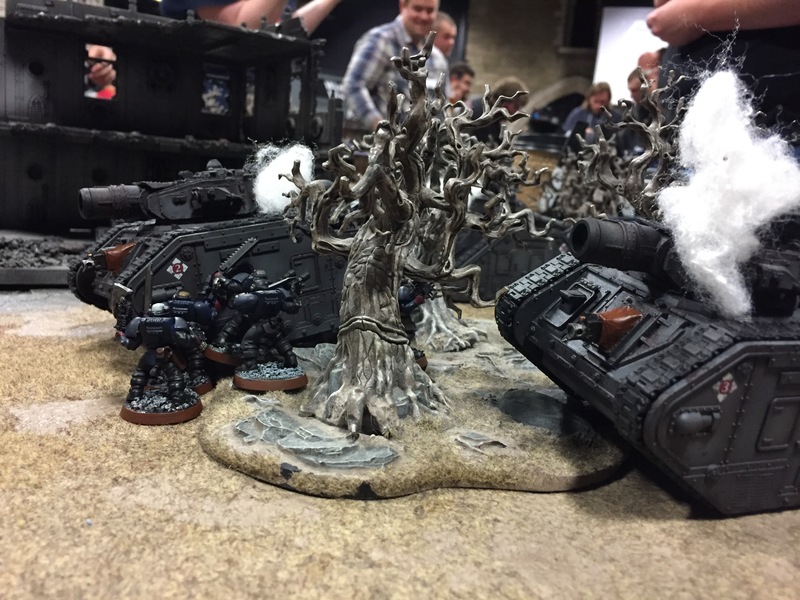 Like the game before, this was another matchup against a Space Marine and Astra Militarum list. 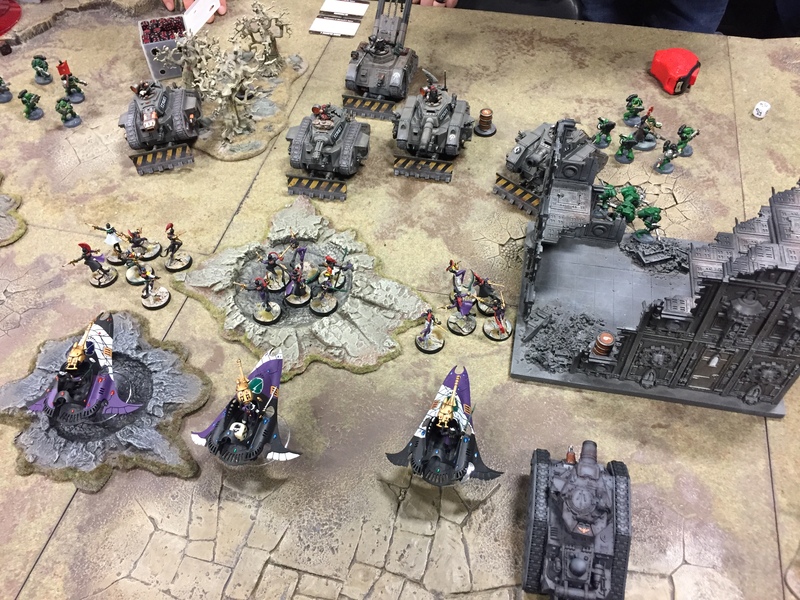 We had decided to (somewhat unfairly) spend the first round targeting the Dark Angles, their fast moving bikes and troop transports needed to be dealt with immediately, while the slower moving guard and even slower tanks could be taken out later. Joe’s Harlequins once again proving lethal in close combat taking out the bikes and a Rhino, while my tanks took out the other. 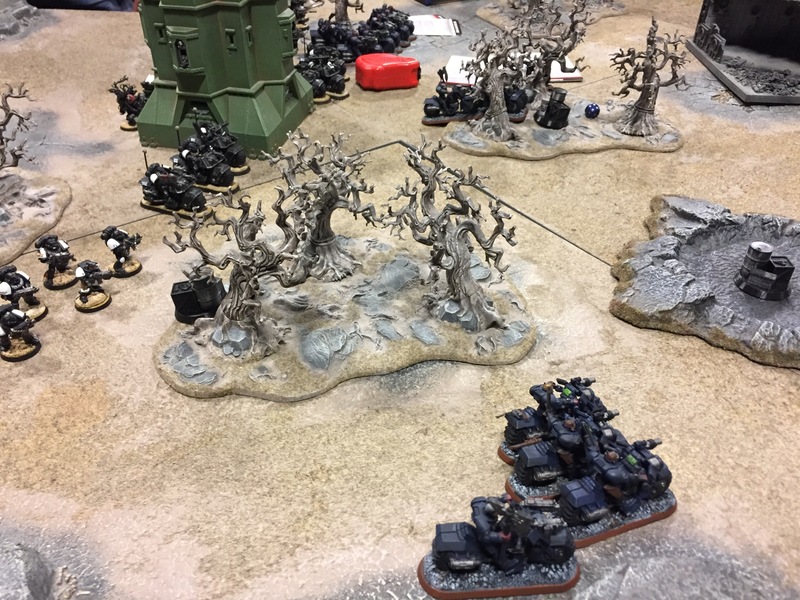 The Marine Scouts on the objective proved impossible to shift and survived longer than we hoped, forcing Joe to send his diminished Troupe against them. His sole survivor likewise hiding out in the crater for the remainder of the game. 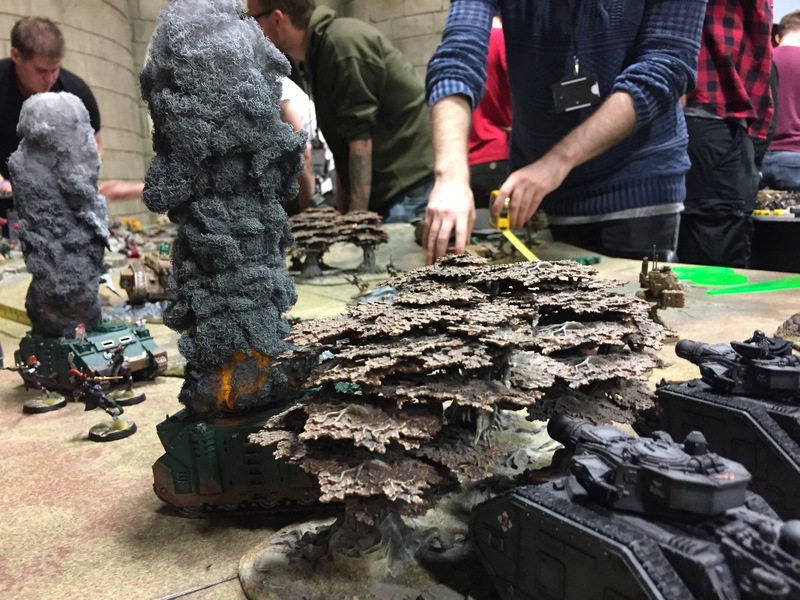 The guys were fantastic to play against and had an awesome set of smoke markers to represent destroyed tank. 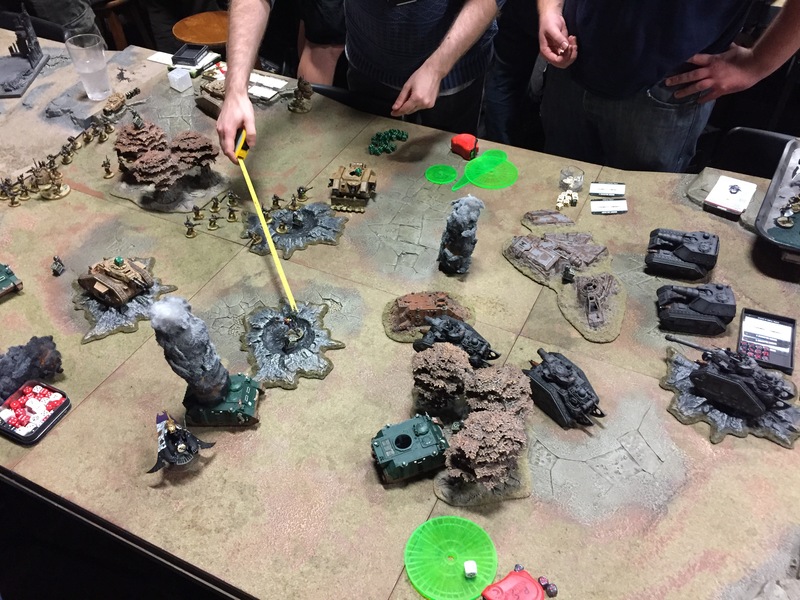 Our final opponent hadn’t turned up so one of the lovely events team members stepped in with his Chaos Daemon army. 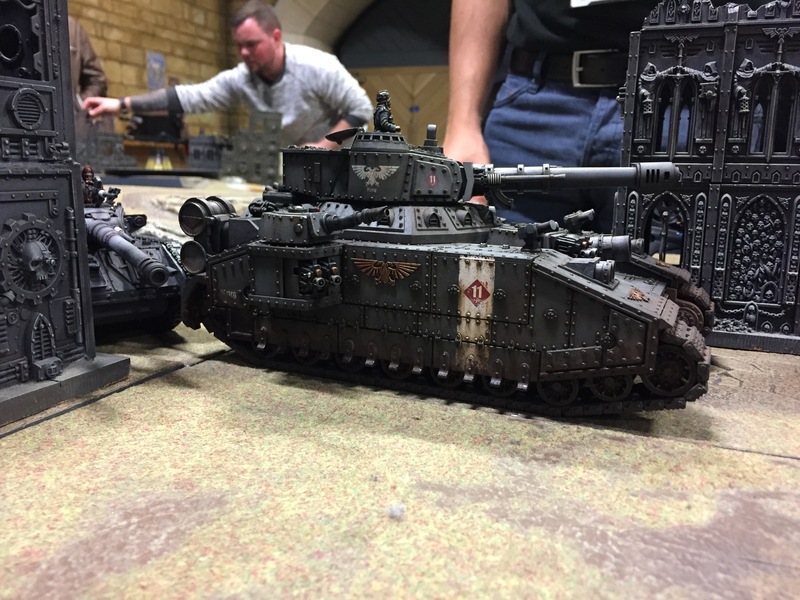 After the last match I had decided to switch over to my alternative list as it’s rare I can bring out the Baneblade. 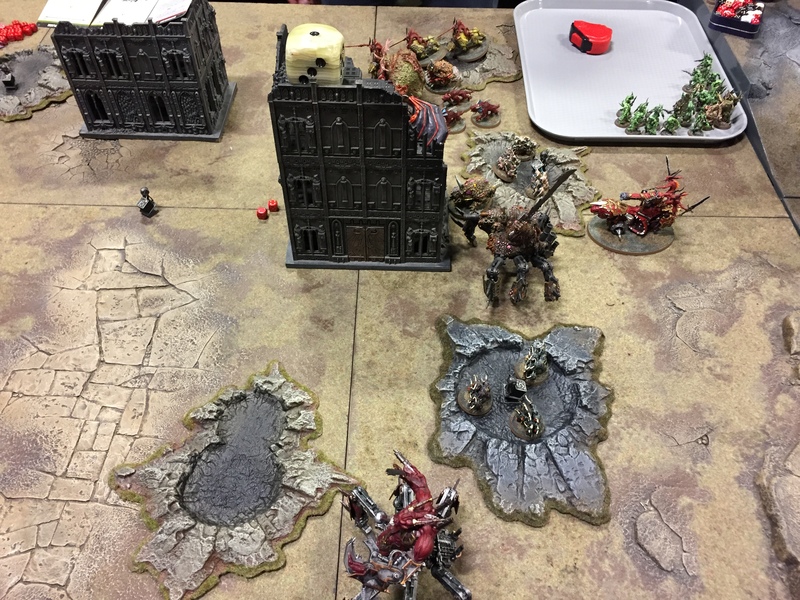 It turned out to be a suitable choice, the Vanquisher with it’s Beast Hunter Shells landed a shot on the Greater Daemon of Nurgle on turn one wiping it from the table. 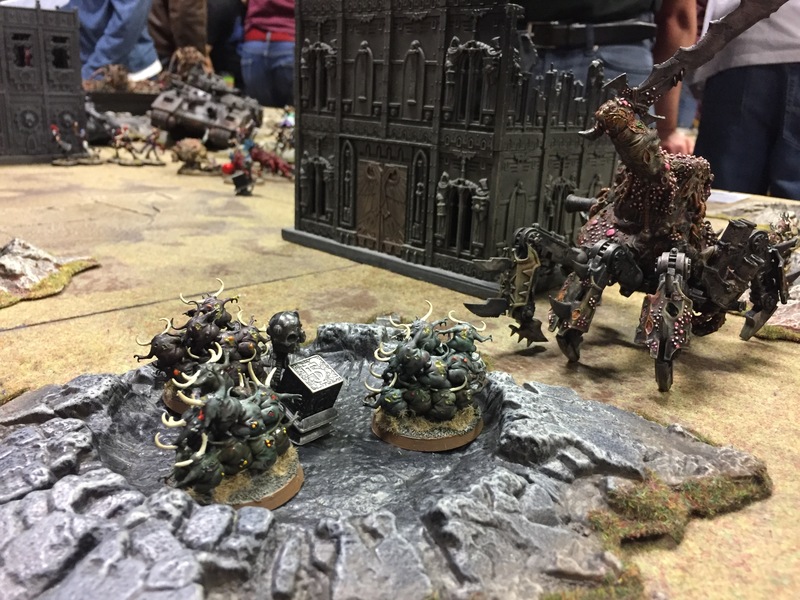 The Halequins moved up to engage the Flesh Hounds and the Soul Grinder, taking out the hounds but failing to kill the Soul Grinder. Both Troupes were severely weakened in the process. Next turn the Vanquisher finished off the Soul Grinder. 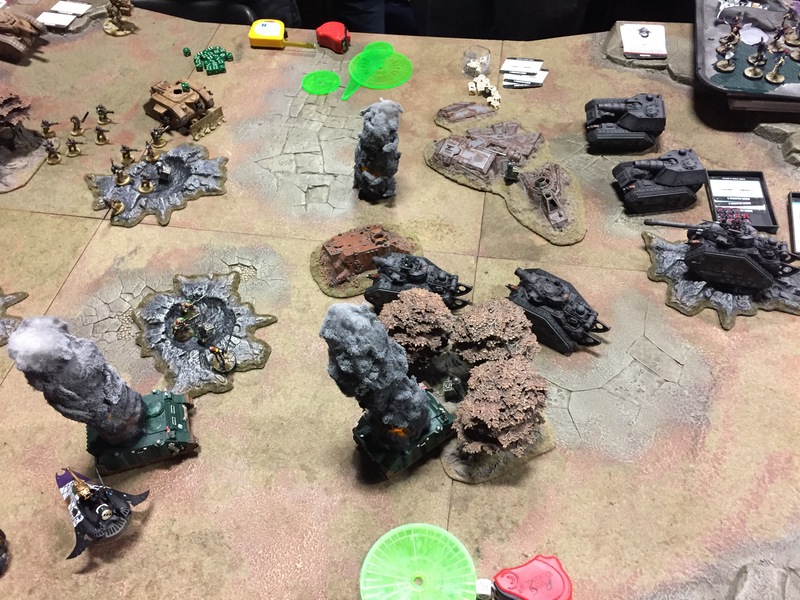 The Baneblade, left unchecked all battle pounded the Nurglings off the objective, though it took several turns due to cover saves. 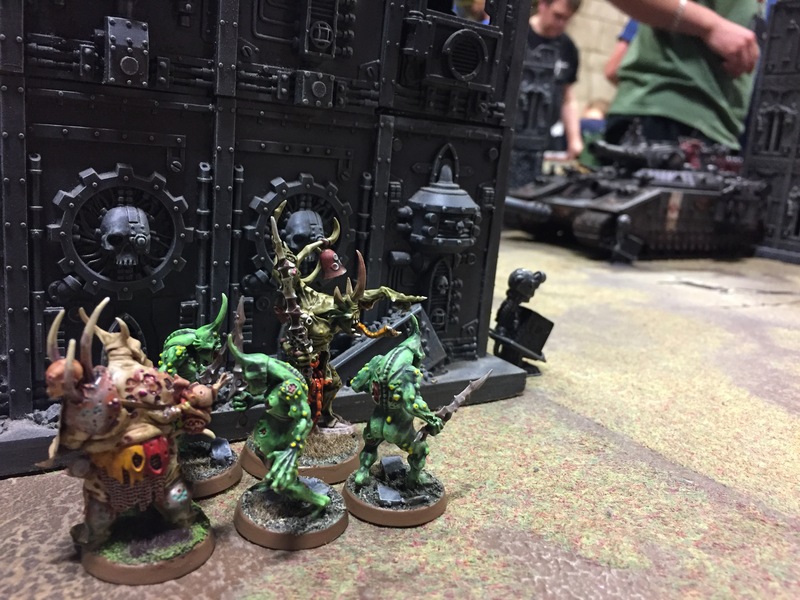 The Herald of Nurgle proved difficult all game, summoning a squad of Plaguebearers which sneaked around the back of a building, charging and destroying the Vanquisher. 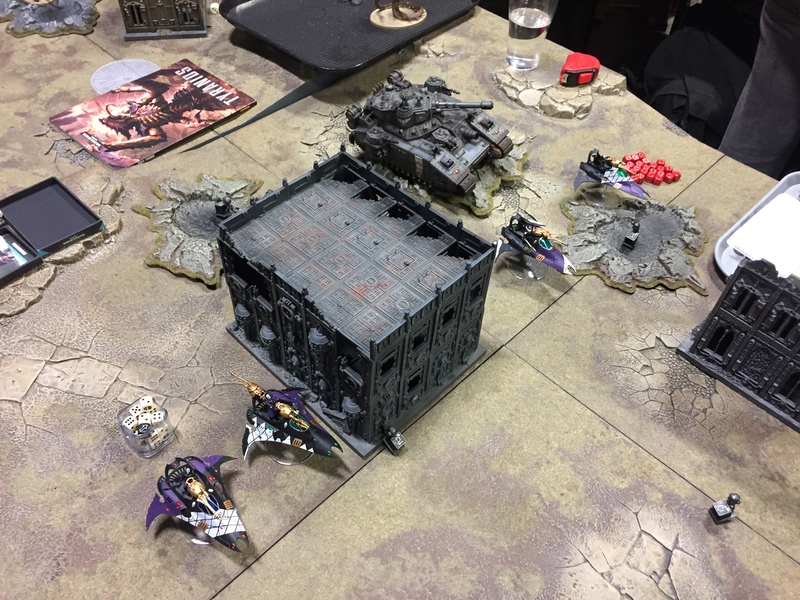 The Herald, due to some lucky saves survived several rounds of shooting from the Baneblade, surviving till the end of the game. Just like in game 3, taking him out would have netted us the VPs for a win. The weekend was a mixed bag of results, with one major win, one major loss, two very close losses and a draw. Three of the matches were all very close and with some better luck we could have won. The Krieg/Harlequin combination worked well, especially considering we hadn’t playtested it before the event. The Krieg’s firepower and durability matched the Harlequins fragility and close combat capability. 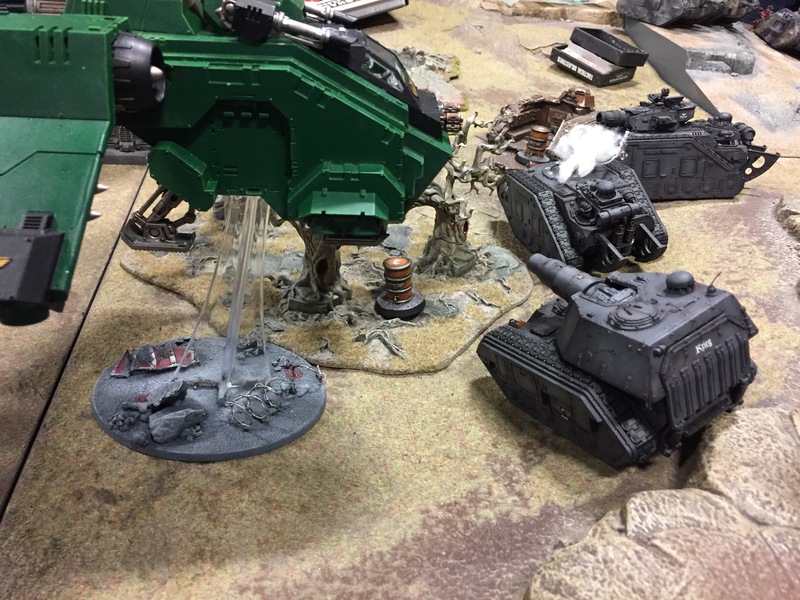 The tanks durability often meant they survived long after Joe’s Harlequin’s were wiped from the table, only really being wrecked when engaged in combat. 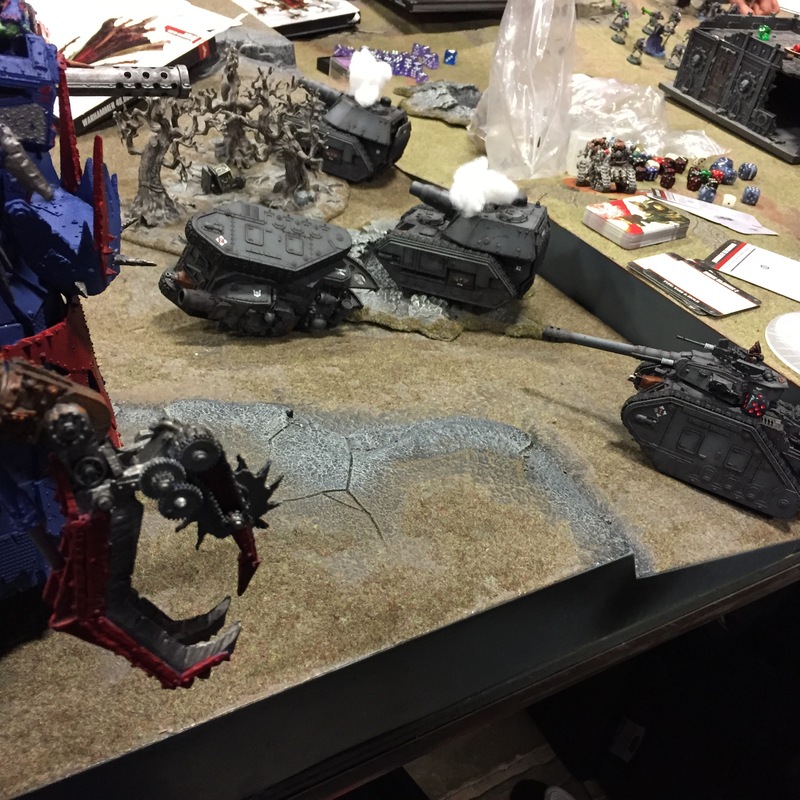 Potentially the tanks are too durable, with the enemy ignoring them and focusing on the Harlequins instead. The biggest drawback with the tanks was suffering from Crew Shaken results, forcing them to snapshot meant their main gun couldn’t be fired and a whole turn wasted. 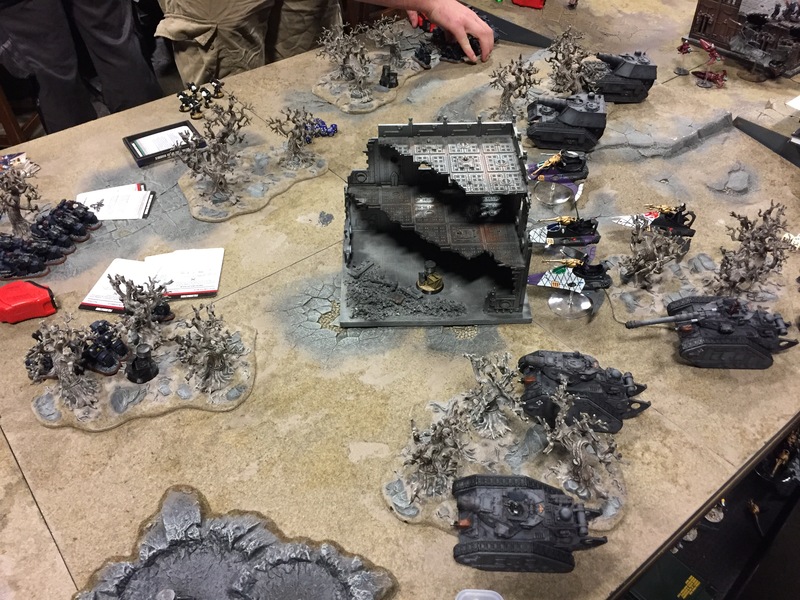 In game two I only killed one Marine because the tanks could rarely shoot and when they did the opponent had plenty of Jink/Cover saves. Krieg’s lack of ignore cover also becoming quite clear. The Harlequin’s are fantastic in close combat and always performed well if they got in combat, normally much to the surprise of our opponents who were expecting an easy win against them. However they often struggled to engage additional units after the first, often finding themselves trapped out in the open and getting shot at. It was a great frantic weekend of gaming. All the games were enjoyable and challenging and as usual with these events you meet some fantastic people. 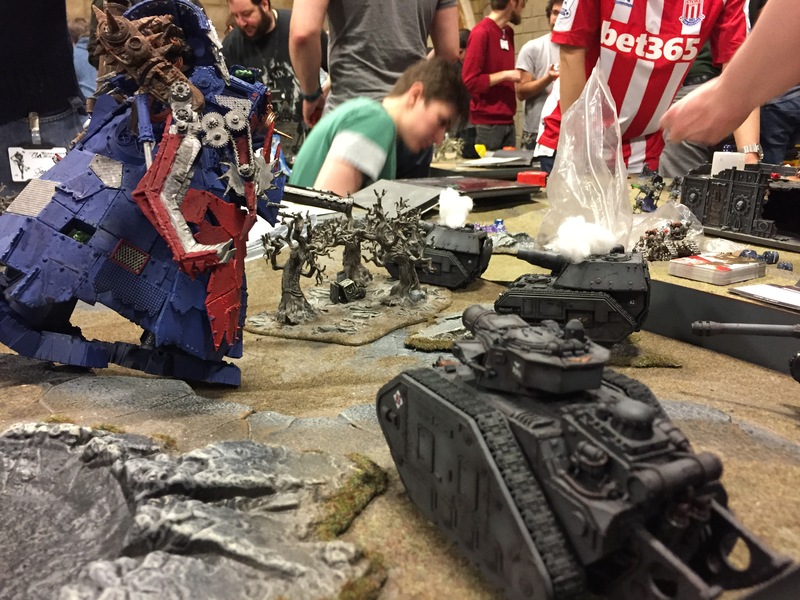 My personal highlight though was taking part in Armies on Parade. I’ve enjoyed playing a tank list, it certainly makes for a quicker game and a nice change. With the majority of my infantry on display at Warhammer World, 2017 will definitely be spent building up my Armoured Battle Group.